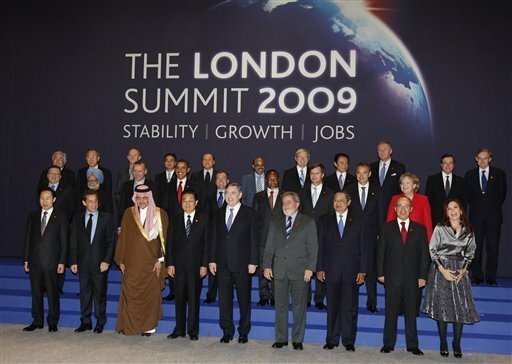 The 20 leading countries in terms of economy – aka the G20 – met today in London and little was said about environmental issues. This is a problem as the Group’s population accounts for 2/3 of the total and 85 percent of the GDP. This appears quite well by reading TreeHugger and George Monbiot’s article in the Guardian with a quite pessimistic view on the apparent lack of concerns of the G20 for these problems. But as we will see, not all hope as gone as thanks to President Obama many of these countries will meet later this month in Washington DC to discuss solely of these issues. The G20’s strategy for solving the financial and economic crisis, in other words, is detailed, innovative, fully costed and of vast scale and ambition. Its plans for solving the environmental crisis are brief, vague and uncosted. The environmental clauses – which contradict almost everything that goes before – have been tacked onto the end of the communique as an afterthought. No new money has been set aside. No new ideas are proposed; just the usual wishful thinking: let’s call the whole package green and hope for the best. So much for the pledge, expressed in different forms by most of the governments present at the talks, to put the environment at the heart of decision-making. Though the economy is merely a measure of our engagement with the environment; though, as most of the leaders acknowledge, continued prosperity is impossible without sustainability, the communique shows that the environment still comes last. No expense is spared in saving the banks. Every expense is spared in saving the biosphere. This suggests to me that our leaders have learnt nothing from the financial crisis. It was caused by allowing powerful agents (the banks) to exploit a common resource (the global economy) without proper control or regulation. Governments deployed a form of magical thinking: that the boom would go on forever, that a bunch of predatory psychopaths would regulate themselves, that profits, dividends and share prices could grow indefinitely even though they bore no relation to actual value. They treat the environmental crisis the same way. Climate breakdown, peak oil and resource depletion will all dwarf the current financial crisis, in both financial and humanitarian terms. But, just as they did with the banks, the G20 leaders appear to have decided to deal with these problems only when they have to – in other words, when it’s too late. They persuade themselves that getting the economy back to where it was – infinite growth on a finite planet – can somehow be reconciled with the pledge “to address the threat of irreversible climate change”. Next time this magical thinking fails, there’ll be no chance of a bail-out. US President Barack Obama has invited 16 major economies to take part in a forum on climate change in a bid to speed up work towards an international climate change agreement. The Major Economies Forum on Energy and Climate will bring together key countries to speed up the negotiations and seal the deal on climate change at the key UN talks in Copenhagen on 7-18 December. Preparatory talks will kick off on 27 and 28 April in Washington D.C., followed by a summit of the 17 leaders in July in Italy, in the margins of the G8 summit. The 17 major economies in the forum are Australia, Brazil, Canada, China, the European Union, France, Germany, India, Indonesia, Italy, Japan, Mexico, Russia, South Africa, South Korea, the United Kingdom and the United States. They move remarkably quickly when it comes to using public money to bail out private interests. When it comes to things which are for the public good, they’re a bit slower. As I always say, they’re not leaders, but followers. This desperate attempt to pump more hot air into the ruptured and sinking balloon of world finance, doomed as it is to failure, is simply their inertia. Often in English “inertia” is thought of as being still, not moving. But inertia actually means to keep moving in the same direction at the same speed unless acted on by an outside force. Governments and corporations have inertia, they will keep moving in the same direction at the same speed unless acted on by the outside force of the public. Unfortunately they do their best to insulate themselves from this force. You cannot expect someone who travels with an entourage of 500 people to have a firm grasp of the wants and needs of day-to-day life for the typical Westerner, let alone the typical Third Worlder. They’ll get it eventually. But it’s a slow process. Yeap, to me they are getting it. It’s not as much as we would like them to understand, but well there is progress.